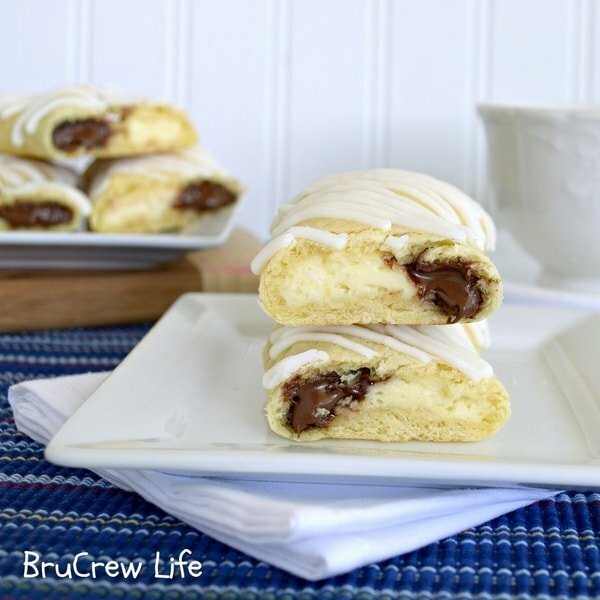 These Glazed Triple Berry Rolls and Valentine’s party ideas were inspired and sponsored by Pillsbury. Something that I have been wanting to do again with my kids is a tea party. But since they really don’t like tea, we have to call it a hot chocolate party. With all the snow that we have been having lately, hot chocolate is a staple around here. The kids go out in the snow and play…I stay inside and make sure the mugs and marshmallows are ready for when they need to get warmed up. Last weekend we decided our hot chocolate needed more fun. More fun like a breakfast party with lots of red and pink accents. I went to the Dollar Store and picked up some Valentine’s plates and napkins and a red heart garland that I could cut apart for decorations, but the rest of the party decor came from looking around my house. It amazes me how much I tend to accumulate over the years. It does make it much easier to decorate for a party without spending a lot on extras. I moved our hot chocolate basket from the kitchen into the dining room and added a few fun accents to the table. Of course the highlight of any breakfast party is the food. 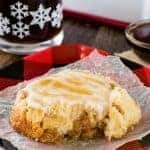 My kids were so impressed with these Sweetheart Cinnamon Rolls. They couldn’t believe they were heart shaped. And of course, sprinkles are always welcome here. 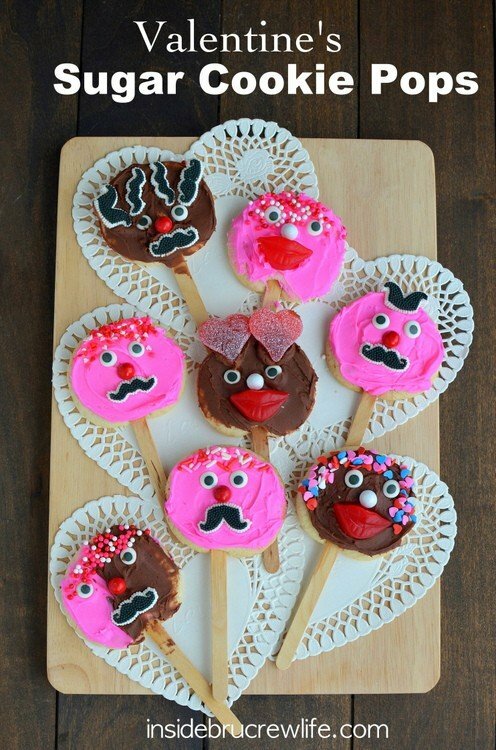 After munching on cinnamon rolls, glazed triple berry rolls, and monkey bread with our hot chocolate, we started creating some fun Valentine’s Sugar Cookie Pops. I found the cute mustache candies at Target and the jelly candy lips at Meijer. 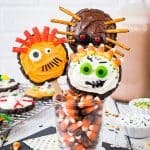 I knew my kids would have a blast using these and all the sprinkles and candy eyes in my cupboard to create some fun cookies. The boys each made one and then decided that eating cookies was more fun than decorating cookies. So, my daughter and I had a good time together using the different candies to create fun faces. She definitely has a creative side in her. I love how she used the extra mustaches as hair and the jelly hearts as eyebrows. And of course putting on sprinkle hair finishes off the look! 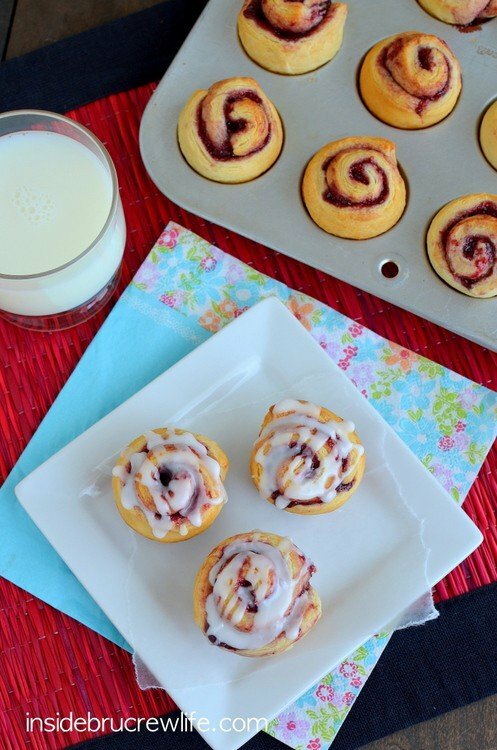 In between decorating cookies, we munched on these Glazed Triple Berry Rolls. These little rolls are full of jelly and couldn’t be easier to put together. You are only 3 ingredients away from having them in your home too. These rolls are also an easy treat for your kids to help you with before the party. Unroll the crescent dough into 4 rectangles press the seams together. Fill each rectangle with your choice of jelly. I used some triple berry preserves that I had. Roll each rectangle up and cut into 4 mini rolls. Baking these rolls in mini muffin tins helps them keep their shape. The drizzle of glaze on top is the finishing touch to make them even prettier. We had so much fun at our little family party, that I can’t wait to plan another one. It definitely makes these long winter days more fun. 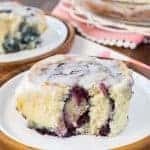 These jelly rolls start with crescent dough for a quick and easy breakfast choice. Separate the dough into 4 rectangles. Press the seams together. 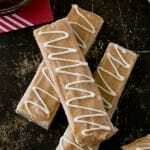 Spread 1 Tablespoon preserves on each rectangle. Roll each one up gently and cut into 4 mini rolls. 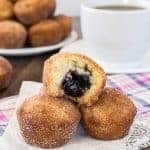 Place the mini rolls into a greased mini muffin tin cut side down. Bake at 375 degrees for 12 minutes. Cool 2-3 minutes in the pan, then gently remove to a platter to cool. Stir together the powdered sugar and milk. Drizzle over the tops of the rolls. Serve warm. Makes 16 mini rolls. You could also sprinkle mini chocolate chips on the preserves before rolling up if you wanted to give it some chocolate flavor. 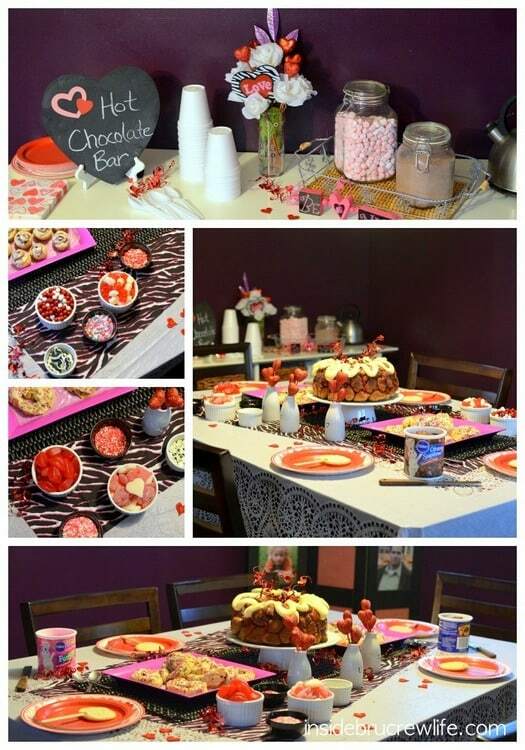 *Inside BruCrew Life was compensated by Pillsbury to create this fun Valentine’s party using Pillsbury products. All opinions are 100% my own. 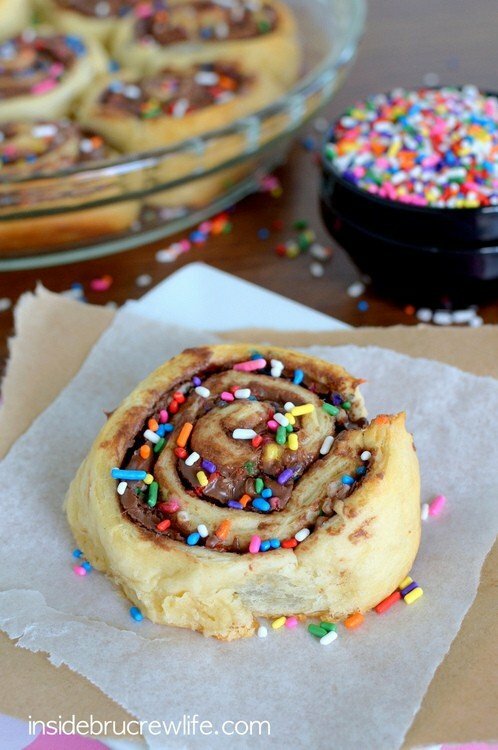 These look so simple to whip up….but I’m distracted by that sprinkle nutella roll. It’s calling my name something fierce. You can’t go wrong with nutella and sprinkles. Whoa! They are just so pretty. Cutest party ever!! Everything was so adorable. 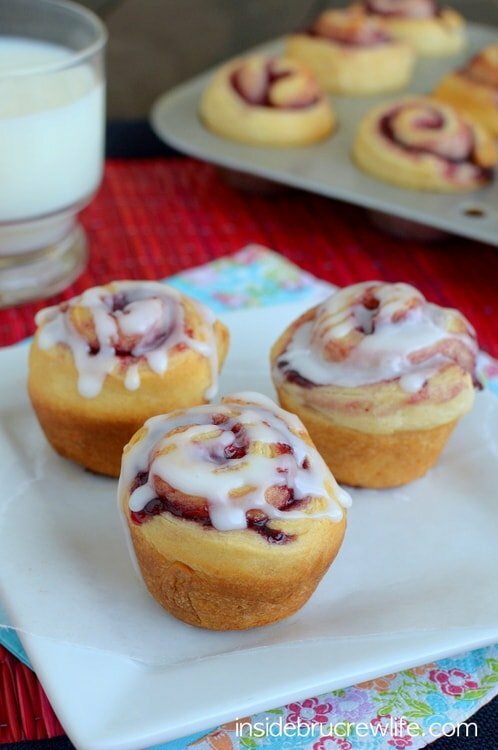 The triple berry rolls look so yummy, but I have to say I’m definitely craving a heart shaped cinnamon roll at the moment! What a great party, so adorable and looks like so much fun 🙂 These triple berry rolls sound incredible and look awesome with the glaze! This looks like a fun party! I am so glad my girls like tea, we do tea parties all of the time! 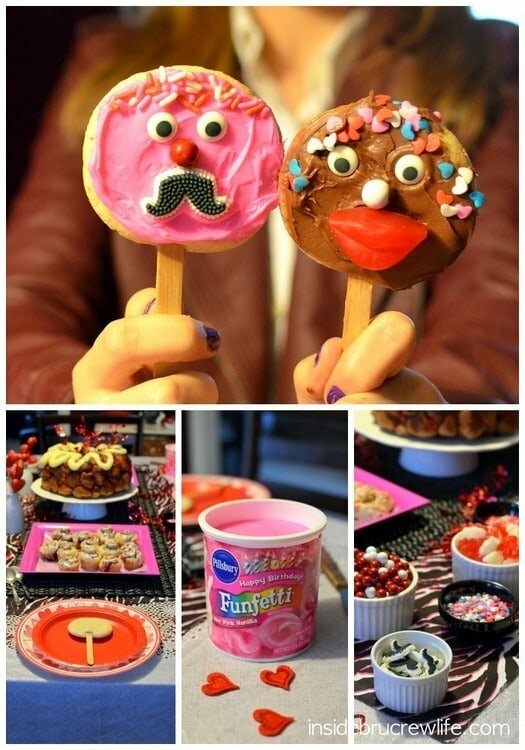 I need to schedule a party just so I can make these! Hi! These look awesome and so easy to make. My only dilemma is that I dont have a mini cupcake pan. Is there any other way to make this without having to buy the pan? Thanks and keep posting delicous stuff. My mouth waters every time i visit!!! Thank you so much Erin. I am so happy you like the fun recipes I share. 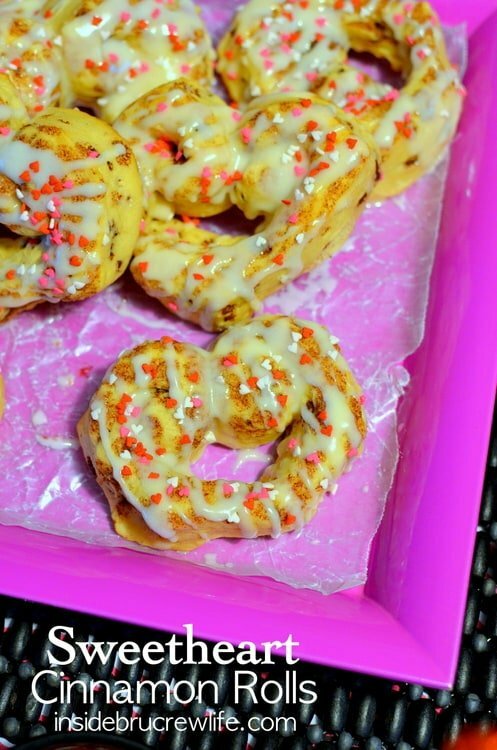 You can make these on a baking sheet too. The mini muffin tin keeps them small and tall. They might be a little flatter on the baking sheet, but still taste just as delicious! How much fun! Grace would love the tea party while Eden would love a chocolate party! These rolls look like heaven! Ooooo! These look so good! I can almost taste them! The fruit is a nice touch, and they look wonderful! 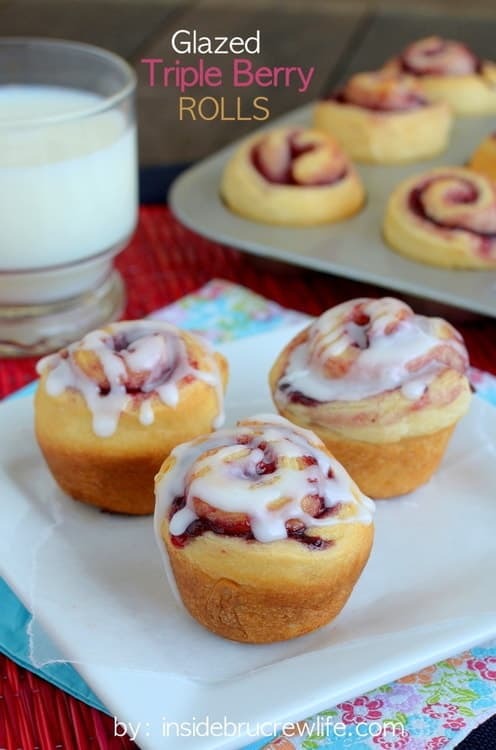 Triple berry rolls looks so yummmy….can’t wait to try this..!!! My mouth is drooling over that glaze! I love how colorful and vibrant these rolls are! These rolls are so pretty! Although the heart shaped ones are darn cute, too 🙂 Haha, we have hot cocoa parties, too – all the time around here! Can I please have some of that!!! Absolutely!! 🙂 You can come to our hot choc party anytime girl!! Oh my goodness! I take 3 please. 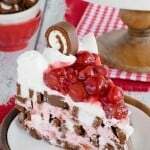 These look absolutely amazing and so, so perfect for Valentine’s (or any day really)! Your little family party sounds so cute!! What a fun idea. 🙂 These rolls look incredible! I think I would throw a party just as an excuse to eat a ton of them! Best. Mom. Ever! Your party looks like so much fun, and these rolls look delicious. Pinned. I am nowhere near as adventurous as you are when it comes to crescent rolls LOL! 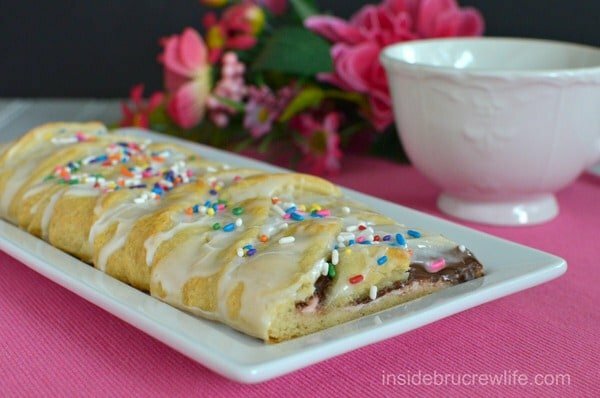 I sometimes make turnovers with them but now I want to try to make all of these too! This looks really delicious and easy.